I’ve been privileged over the years to play many of Pete Dye’s most notable creations. The four courses built for Herb Kohler at the American Club Resort in Wisconsin. Kiawah’s Ocean Course. Bulle Rock in Maryland. Mystic Rock at Nemacolin Woodlands Resort in Pennsylvania. Lost Canyons outside Los Angeles. TPC Stadium at Sawgrass in Florida. Teeth of the Dog, his seaside gem at Casa de Campo in the Dominican Republic. The list goes on. I’ve never had much luck on his layouts, but I’ve always been entertained by Pete’s aw-shucks approach and amazed by his chameleon-like ability to reinvent his architecture at each one of his “Gotcha!” golf courses. Still, when I received his letter on West Baden Springs Hotel stationery in June, 2008 inviting me to a media preview of his new course at French Lick Resort, I was a little surprised by what he said. Dye goes on to say how excited he is to have one of his designs alongside Donald Ross, noting that French Lick Resort is the only resort destination in the world where golfers can play courses by Ross and himself. He and the Scotsman may be miles apart in design philosophy, but when it comes to building courses, they have one thing in common: They’re both geniuses. Unveiled in 2009 and positioned as an exclusive, high-rollers venue with a $350 green fee, the Pete Dye Course at French Lick is by turns the most beautiful, entertaining and awe-inspiring course on the legendary designer’s resume. How is that possible? The indefatigable Dye, who spends his summers in Carmel, Ind. with wife and co-designer Alice, made over 100 visits during course construction to achieve his desired effects, both strategic and aesthetic. Pete will be the first to tell you he’s a builder, not a designer. He actually hand-rakes dirt to create subtle chipping swales around his greens. I’ve seen Pete after a hard day’s work. He’s dirty. And proud of it. Tee placements for The Legends Championship, a season-ending event featuring over 66 LPGA senior players that gets under way at the Pete Dye Course this week, will be set at a sensible distance for the 54-hole tournament. At 8,102 yards, the gold tees are out of the question for the ladies (and for 99.9% of the gentlemen, amateur or professional). The black tees, at 7,254 yards, are harrowing. The blue markers, at 6,701 yards, can be managed by a single-digit player. We played the white tees, at 6,115 yards, and were thoroughly delighted without being overwhelmed. Pete gets right down to business at the par-4 first hole, a sweeping right-to-left dogleg that drops more than 80 feet from tee to fairway. The second, a short par 4, introduces a range of “volcanos” up the right side, their dished-out calderas filled with sand. They are strange, alien landforms intended to create visual dissonance. Only Dye would think to build them. The third hole is the first of four par 5’s that, collectively, rank among the finest set of long holes Pete has ever built. This one is a daunting Cape-style hole that swings to the left around a deep, grassy ravine. It asks players to commit to an angle and bite off what they can chew on their second shots. Classic risk-reward. To his credit, Dye varied the green sizes considerably on his Hoosier bruiser. Some of the greens are under 5,000 square feet, and some are larger, but they vary from hole to hole. Unlike the old-style greens at the Donald Ross Course, which are sloped mainly from back to front, Dye’s greens are not tilted to the fairway but contain oodles of interior undulation. Given today’s green speeds, Pete was smart enough not to overcook the putting surfaces on his epic creation. Like all Dye courses, this ridge-top layout builds in interest and drama as the round progresses. 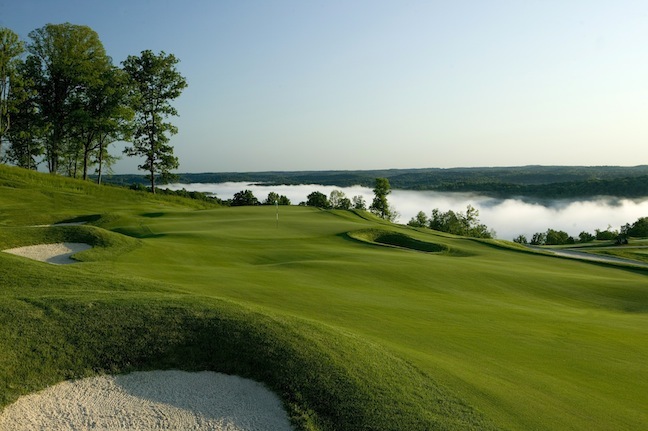 The par-4 12th offers spectacular panoramic views of the surrounding Hoosier National Forest. The par-3 12th is a brilliant Redan-style hole that invites players to draw the ball to the front right portion of the green, where it inexorably releases to the center. The 14th is a colossal par 5 with a split fairway that climbs to a shallow, kidney-shaped green. There’s trouble everywhere, but much of it is visual hijinks. Players who plan and execute their shots properly, as we Warriors did, will get their reward. Even Pete admits that his 18th hole, a par 5 stretching to an ungodly 657 yards, is controversial. “The end result had a lot to do with the topography,” Pete said, which explains nearly every hole on the course. This enormous, boomerang-shaped thriller makes a right-to-left hairpin turn around a plunging ravine, with a long, sock-shaped green perched above the precipice. The trick on the tee shot is to aim well right to a blind fairway and then safely tack away from trouble, defined here as deep bunkers, gnarly rough and ankle-cracking slopes. 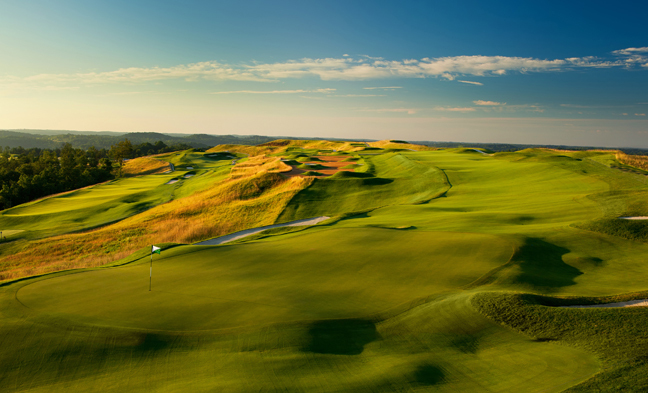 Despite its massive scale, the Pete Dye Course at French Lick is walkable. Pete himself insisted on walking the entire course on opening day four years ago. My advice: Let the forecaddie drive your cart so you can savor this top-of-the-world masterpiece set nearly 1,000 feet above sea level, an Everestian height in Indiana. The resort has put together several autumn golf packages featuring the Pete Dye Course. On a fine fall day with the trees below ablaze in shades of amber and crimson, there can’t be a more scenic, challenging or better-groomed course in the Midwest than this extraordinary layout.